I spent Thanksgiving week 2002 in Kaua'i, known as the Garden Isle of Hawai'i or the Discovery Isle. What I discovered was a stunningly gorgeous, pastoral, rural place which at times could be as comfortable and familiar as your own backyard, or as surrealistic as a midsummer's dream. It is a land overflowing with beauty around every corner, from the grandest ocean panorama to the tiniest, most exquisite flower. I hope my photographs can convey some of this to you. 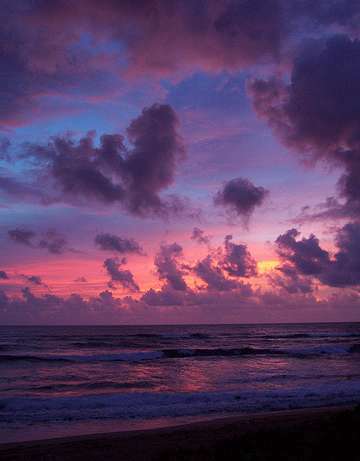 The photo above was taken outside of the town of Hanalei, on the north shore. My first full morning there I was greeted by this tropical sunrise. 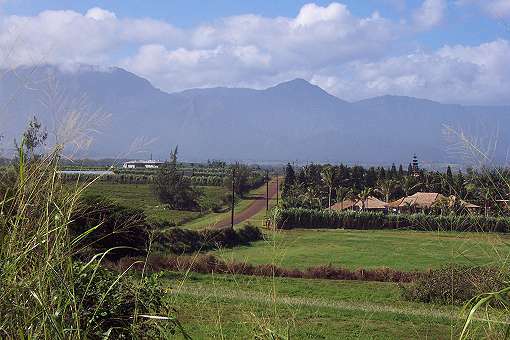 Much of Kaua'i is farmland, and at times if it wasn't for the mountains, the tropical foliage and the ocean which never seems very far away, you might mistake yourself for being somewhere on the U.S. mainland. Also ubiquitous on the island are chickens, such as the family shown above - proud papa Rooster, Mom and their brood. When I stepped off the plane on my arrival, chickens were running all over the airport. I knew I was going to like it in Kaua'i. Right smack in the center of the island is Mount Wai'ale'ale, which is officially designated as the wettest spot on the planet. That area gets in excess of 450 inches of rainfall a year! 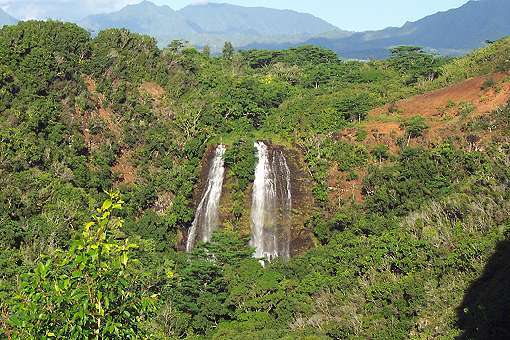 With that much water being constantly supplied, Kaua'i is graced with countless waterfalls. 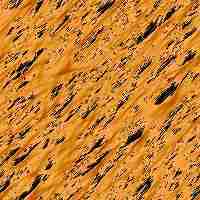 This is a picture of Opeakaa Falls. 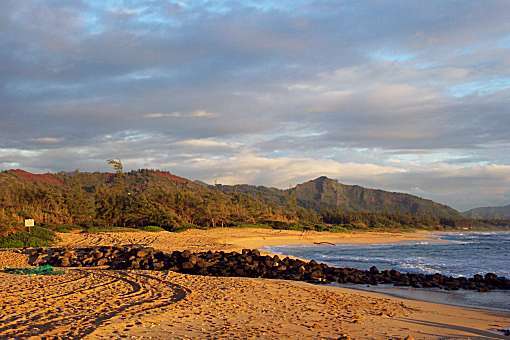 Golden beaches abound everywhere in Kaua'i. If you come across a beach and it doesn't quite meet your exact specifications, you are sure to find another one very close by that will. 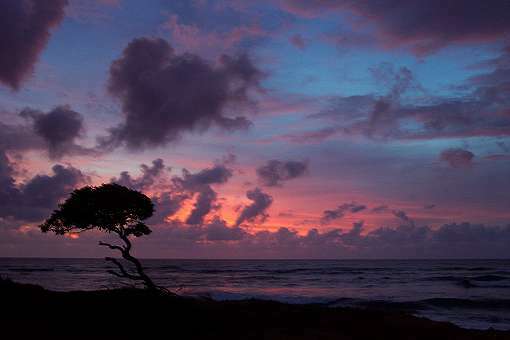 A typical day in Kaua'i would begin with a dramatic sunrise, and end with an equally sublime sunset. 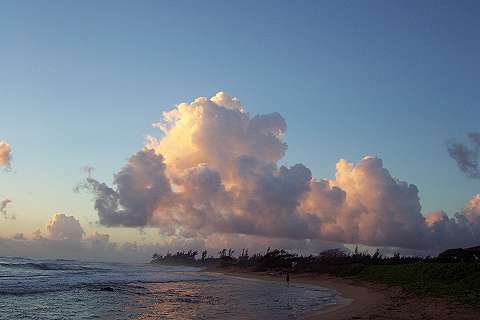 The sunset photo was taken on Barking Sands beach on the west coast of Kaua'i.